Wales senior caps Tyler Morgan and Dafydd Howells are included in the Wales Under-20 squad for the 2015 World Rugby U20 Championship. Ospreys lock Rory Thornton captains the 28-man squad for the tournament in Italy, which runs from 2-20 June. Morgan, who holds a national dual-contract, missed most of the Six Nations with a knee injury. 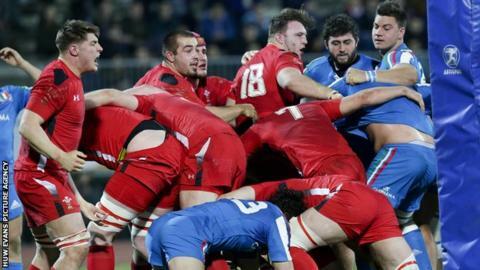 Wales will face France on 2 June, then play defending champions England and Japan in their pool. Morgan's selection will not preclude him from joining Warren Gatland's senior World Cup squad, if selected, after his U20 duties finish. Wales U20 coach coordinator Allan Lewis said: "Our first two games are going to be real tests of our mettle. "We will have to perform very well to beat France on the opening day and England are double world champions at this level. "So although we beat them in the Six Nations - and we will draw some confidence from that - they are the team to beat in this competition and this will be a different challenge." Six players remain from last season's Junior World Championship squad - Thornton, prop Luke Garrett, scrum-half Tomos Williams, wing Joshua Adams, Howells and Morgan. Flanker Tom Phillips and lock Seb Davies also return after injury, while Joe Davies has been ruled out. There are four uncapped players at this level - locks Seb Davies and Lee Taylor along with Dragons pair Lloyd Lewis, a wing, and prop Leon Brown. Brown was on the bench for Wales U20 against Scotland in the Six Nations, but played most of his rugby at U18 level this season. "We've got good experience in the squad and the Six Nations enabled us to find out what we needed about most of the selected players," Lewis added. "We have an established front row and the scrum is one of our strengths." Forwards: Luke Garrett (Dragons/ Cross Keys), Keagan Bale (Dragons/ Cross Keys), Dillon Lewis (Blues/ Pontypridd), Joe Jones (Blues/ Cardiff), Leon Brown (Dragons/ Cross Keys), Ryan Elias (Scarlets/ Carmarthen), Liam Belcher (Blues/ Pontypridd), Torin Myhill (Scarlets/ Llanelli), Rory Thornton (Ospreys/ Bridgend), Adam Beard (Ospreys/ Aberavon), Seb Davies (Blues/ Pontypridd), Lee Taylor (Carmarthen), Tom Phillips (Scarlets/ Llanelli), Ollie Griffiths (Dragons/ Newport), Harrison Keddie (Dragons/ Ebbw Vale), Jon Fox (Ospreys/ Swansea). Backs: Tomos Williams (Blues/ Pontypridd), Kieran Hardy (Scarlets/ Carmarthen), Jarrod Evans (Blues/ Pontypridd), Daniel Jones (Scarlets/ Carmarthen), Garyn Smith (Blues/ Pontypridd), Lloyd Lewis (Dragons/ Newport) Tyler Morgan (Dragons/ Newport), Owen Watkin (Ospreys/ Bridgend), Joshua Adams (Scarlets/ Llanelli), Joe Thomas (Ospreys/ Swansea), James Whittingham (Blues/ Pontypridd), Dafydd Howells (Ospreys/ Neath).